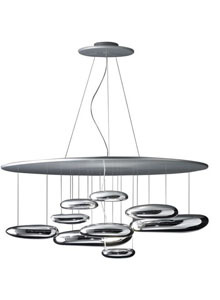 Artemide Mercury Ceiling Light by Ross Lovegrove. The futuristic Mercury lamp was designed by Ross Lovegrove for Artemide in Italy. This version is the ceiling mounted Mercury lamp. The Mercury lamp is a ceiling fixture that places a floating assembly of large pebbles below a simple modern aluminum disc. These in turn reflect each other, bouncing light between their taught bio-morphic surfaces and reflecting the environment around them. The reflective pebbles are made of molded thermoplastic with a polished chrome finish. The Pebbles contain the light source in a die-cast aluminum, polished chrome finish. The Mercury lamp further features a grey thermoplastic canopy with clear electrical cords and stainless steel cable. During the day, the Mercury lamp acts as a sculptural object reflecting the dynamics of natural light and movement of people around them. Best of all, the Mercury lamp is UL listed which makes it suitable for both residential- and commercial projects. The Artemide Mercury Ceiling Light is the winner of the reddot design award: best of the best. The Artemide Mercury Ceiling Light is available with LED lighting.